I love to plan parties and decorate for holidays and special occasions, so I started dreaming up plans for my sister’s bridal shower soon after she and her fiancé Dave announced their engagement. Since we live in different states, the party planning had to be meticulous, which required months of spreadsheets, documents and lists (and dozens of phone calls with my mom in Michigan). In addition, my wonderful father spent almost four hours at Walmart the day before the shower, buying everything I asked for (including six kinds of chocolate), and my mom helped with a ton of the baking and food preparation. My aunts, who came to town from Minnesota, also helped a lot with the decorations. I arrived in town on Friday, and 24 hours later, we had a party! Here are a few decor/food highlights. I decided to have an autumn tea party theme for the shower, so I wanted the decorations to look a little like an Alice in Wonderland tea party but less creepy and more rustic. 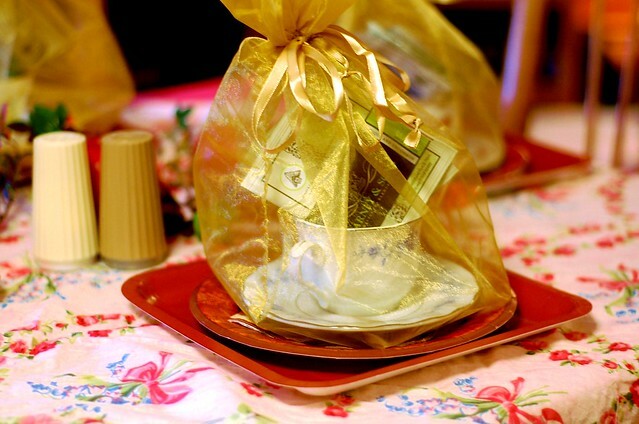 My mom and other family members helped me collect dozens of vintage teacups, which we gave to our guests along with a few bags of fancy Harney & Sons tea (below). I also had six kinds of teas for people to drink during the party itself, using the teacups we gave them. Next to each bowl of tea bags, I included a small dish of the loose tea for everyone to smell and a card describing the type of tea and the best way to drink it. 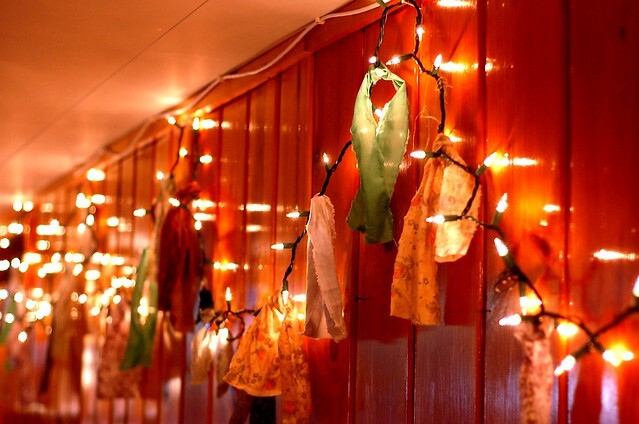 I hung Christmas lights around the door and tied scraps of vintage fabric to give it the homey feel of an Anthropologie store. I also painted a bunch of pumpkins with light blue latex paint and put a few of them by the door to greet our guests. I used mismatched pieces of vintage fabric for the tablecloths, figuring that the less things went together, the more they would look cohesive. I left the edges raw and ripped the fabric to the size I needed. I also hung strips of the same fabric from white Christmas lights in the basement, which gave the room a nice glow and a burst of color. 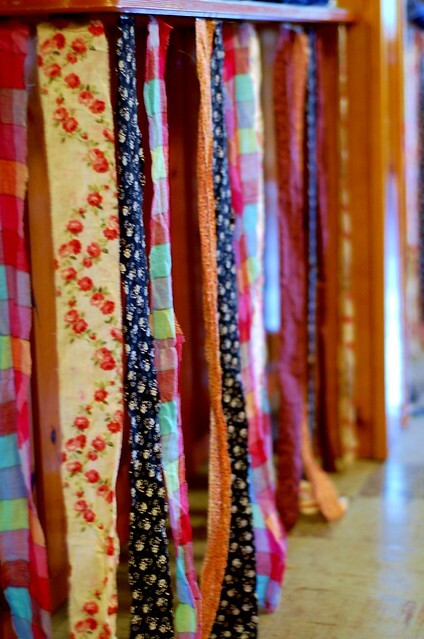 I hung longer strips from the counter where we served our food, which covered the wood paneling below it and made it a little more feminine. 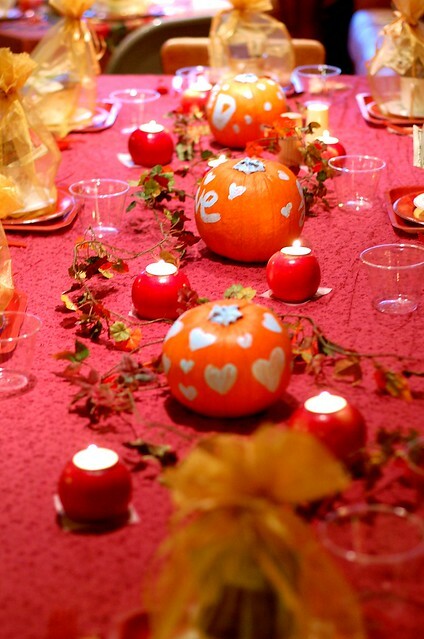 The tables were set with simple autumn-patterned paper plates and plastic utensils. Since we had about 30 people coming, I wanted to keep cleanup as easy as possible. 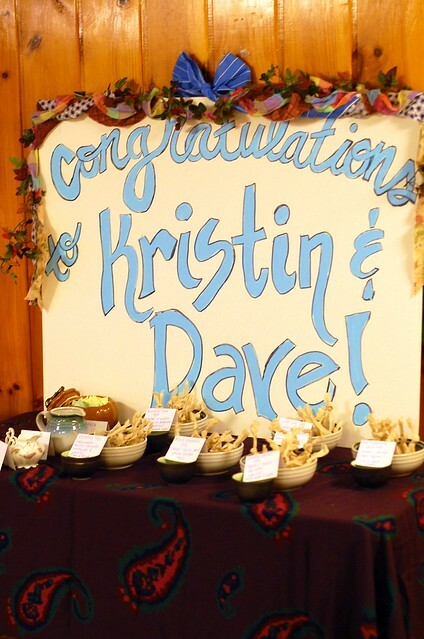 We set the party-favor bags, which included the teacups, on top of the plates. 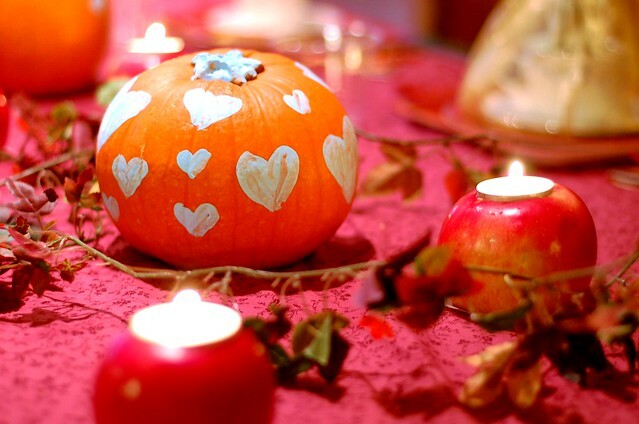 The centerpiece was a combination of the painted pumpkins I’d made, a faux-leaf garland and some beautiful apple candles, which I’d seen ages ago online and had been wanting to try. To make the apple candles, dad and Dave drilled holes in each apple and cut the bottom so it would sit flat. We then put tealight candles in each one and arranged them on the tables. I was a bit worried that we’d accidentally burn the house down, but other than one small incident with the tulle gift bags, they were fine. My mom and I lucked out and had a lot of help in the food department, especially from my aunts and a few of my sister’s friends. Among the surprise hits I’d made were the pumpkin hummus, which was spicy and weird but oddly delicious, and the baked brie wrapped in phyllo dough. My mom’s apple crisp is always a crowd pleaser as well, as were all the dishes that my family and friends brought, which included homemade rolls, fruit pizzas, a fruit salad that looked like a work of art, macaroni salad and veggies. We also had a s’more station at the fireplace. Among the choices to stuff the s’mores were graham crackers and chocolate wafers, Nutella and peanut butter, marshmallows (of course), six kinds of chocolate and fun-size candy bars. What can I say? We had a great time. Thank you sis for the beautiful shower! It was amazing! Love the apple candles, the fabric… love how warm and homey it feels. Fantastic job grrrrl. Wow – this is amazing!! It appears that your description of all that went into decorating for the shower was more work than actually putting on the shower! I’m always so admire someone who is so clever and crafty! Congratulations Elysia – I’m sure Kristin loved every minute of it. 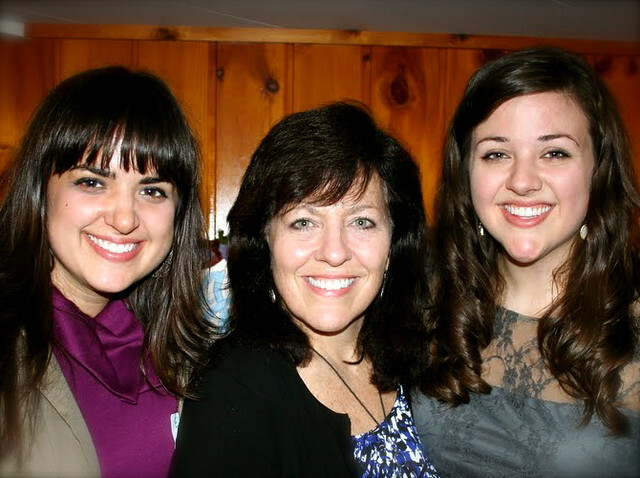 And I love the picture of the 3 Englund girls – what a beautiful trio! I always knew your mom would have a beautiful family when I babysat her almost 50 (!) years ago!! Elissa, everything looks so beautiful! Thanks for sharing the details here. By the way, is the same basement from your charming piece about family holidays? Yep! It’s the official Englund/Townsend family party basement!